Stirring hydrated lime into deep litter. Many poultry techniques that were once well-understood became shrouded in mystery after the poultry business shifted to factory farming. The old-time diversified farmers passed away, and there are generations of industrialized farmers between us and them, breaking our cultural continuity. 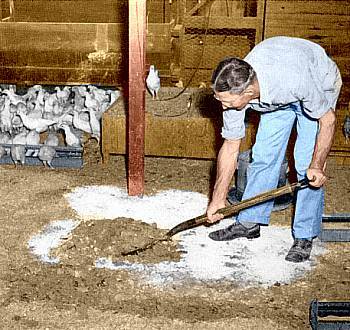 To a lot of critters—raccoons, coyotes, bobcats, dogs—your free-range flock is a 24-hour all-you-can-eat chicken buffet. Maybe, must maybe, the local predators are afraid to run off with your chickens today. But it won’t last. Getting started with baby chicks? Robert Plamondon, author of Success With Baby Chicks, tells you what you need to know. 1. 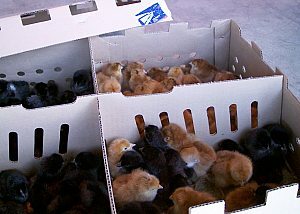 How should I brood day-old chicks? For a complete list of steps, see my baby chick checklist.